We are proud of the diet service we created at MyNetDiary, especially its diabetes functionality. We have worked to build the best tools and program in the world so people can succeed with their health goals, and we are very passionate about creating awesome software. With this in mind, we wanted to put up a comparison against some of the competing diabetes apps on the market and highlight where we think MyNetDiary is truly better. Here we compare MyNetDiary Pro vs. Glucose Buddy Pro – one of the most popular iPhone diabetes apps. One important consideration is that MyNetDiary has worked exclusively and professionally in the area of diet, weight loss, and diabetes since 2005, providing comprehensive online and mobile services and apps, while Azumio Inc (the maker of Glucose Buddy) is a younger company, working in many areas of health and wellness. Most importantly, MyNetDiary keeps working on the diabetes app and keeps improving it following user feedback and the latest technology developments. Glucose Buddy is no longer seems to be updated or maintained, as the last update was in October, 2012. MyNetDiary's focus on diet and diabetes enabled us to create very comprehensive, professional, and yet easy to use apps, providing one-stop-solution to diabetes tracking. Glucose Buddy does not even have any built-in food and exercise database, making accurate carb tracking very difficult and time consuming. Glucose Buddy does not provide any support for weight management or weight loss - it has no diet planning tools, no food database, no exercise database. With Glucose Buddy, you cannot get the whole picture of your diabetes and learn about relationships between blood glucose readings and carbs, insulin, medications, time, and exercise. Essentially, this is a simple, glorified BG and insulin tracker. As you can see below, MyNetDiary clearly has many more useful features, but they are well-designed and not cluttered. The most frequent word in user reviews of MyNetDiary is "easy". Everything is easy and everything is there, in MyNetDiary, when you need it. Multiple Target BG Ranges – MyNetDiary supports multiple target blood glucose ranges, while Glucose Buddy only has one target blood glucose number. You can customize pre- and post-meal ranges and even define your own types of ranges in MyNetDiary. Multiple Labels – in MyNetDiary, all tracker readings (such as blood glucose or insulin) can have several labels assigned, not just one label such as "Before Lunch" or "After Lunch". This is very important if you want to log more information, and see more factors affecting your blood glucose. MyNetDiary has over 100 additional labels and supports custom labels, so, for example, you can assign both "Before Lunch" and "Feeling Hypo" or "Headache" labels. BG Reminders – MyNetDiary provides built-in BG reminders. You can set multiple reminders for a day, which will play a sound and popup as a notification, reminding about measurement and letting quickly jump to the BG entry mode. You can also configure "after-meal" reminder prompts. It's very convenient, one-tap action, which could greatly help you test your BG how you want it, reducing the chances of forgetting to test BG. Today Widget – On iOS8 and later, MyNetDiary provides a great Today Widget, helping you to check your day at a glance, and providing shortcuts for even faster BG, food, and water entry. Apple Watch App – MyNetDiary is the first diabetes app that provides a special app for Apple Watch. If you wear an Apple Watch, the app will show up on it, providing a glance with food calories and a few simple screens allowing to view BG average and next BG check reminder, review daily foods, get tips and recommendations about today’s food, quickly log water glasses and weight. Apple Health Integration – MyNetDiary can export all foods with up to 45 nutrients to Apple Health app, BG, BP, weight, and exercises. MyNetDiary can import workouts created by other popular apps, such as RunKeeper or MapMyRun. Food Database – MyNetDiary has 705,000 verified foods database, updated daily. MyNetDiary Diabetes Tracker provides awesome PhotoFood Service – for foods that are not in the database or out-of-date you can send their photos directly from the app, which will be verified and entered by MyNetDiary's professional data entry team, resulting in high quality database. Food Entry – MyNetDiary instantly searches as you type, remembers your previous searches, remembers your servings, and even corrects typical typos. Food entry in MyNetDiary is the fastest and simplest in the world, saving you time and effort every day. Built-in Barcode Scanner – MyNetDiary app provides built-in barcode scanner for the fastest and easiest food entry. Community Supported by Certified Diabetes Educator – MyNetDiary has an active online community, with Community Forum supported by a Registered Dietitian and Certified Diabetes Educator. MyNetDiary covers many diabetes-related topics in its articles and blog posts. Analysis and Feedback – MyNetDiary provides comprehensive analysis of your diet, foods, nutrients, pointing out problematic foods, nutrient deficiencies, providing recommendations, it even provides special Food Score to help you compare foods, helping you eat better and make better choices – it's like having a personal dietitian always with you! Glucose Buddy does not track foods and does not provide any feedback and advice in this area. Comprehensive – MyNetDiary tracks up to 45 nutrients, tracks all body measurements, blood pressure, A1C, LDL and HDL cholesterol, vitamins, notes, and more. And MyNetDiary keeps it simple – all these features are there when you need them! Glucose Buddy tracks only 10 nutrients including calories. Glucose Buddy does not track measurements at all. Custom Trackers – in addition to built-in BG, A1C, BP, cholesterol and medication trackers, MyNetDiary supports custom trackers. You can create and track any health metric needed, or recommended by your healthcare provider, such as quality of sleep, stress level, or food satisfaction. 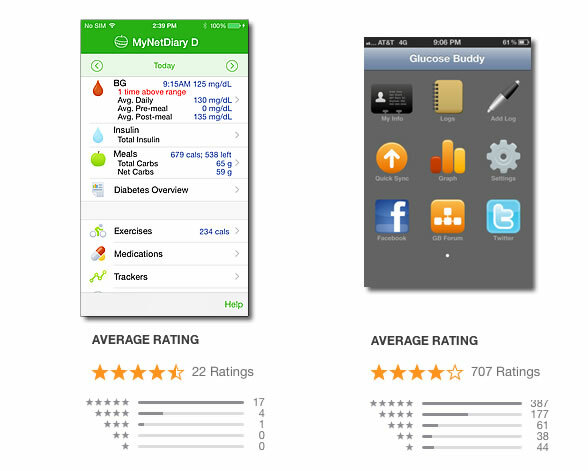 We selected a few of many dozens of reviews of MyNetDiary Diabetes Tracker on the App Store. This app was not the first one I used, and approximately 2/3 of the 90 lbs. I lost over the past 10 months was with the other app, but if I had known about this app I would have used it exclusively. It's accuracy with nutrition in relation to diet, exercise, weight, & calories is the best I have seen so far. As a result of this app I am better able to manage my tendency towards diabetes, completely eliminated any cholesterol issue, and better track BP, which has returned to normal. The main reason I found this app at all is because I was tired of using several different apps at the same time to manage and track my issues. This app does it all and allows you to track your progress on many levels. The Best! If someone is serious about their health and wants to manage weight, nutrition, diabetes, high BP, and cholesterol, this is the app. It works, no question. This app gives me the insight and discipline to manage my weight, nutrition and my diabetes. Intuitive functionality combined with an exhaustive and ever growing database makes this the app to own and use for better health.